Rough Opening: 82.5" Ht. x 38" W.
Clear Door Opening: 78" Ht. x 30" W.
The 8030 Estate Vault Door is a high-security vault door with a clear door opening of 78 in. high by 30 in. wide. Our most compact vault door, the 8030, is built to meet and exceed FEMA P-361 and ICC 500 safe room specifications. 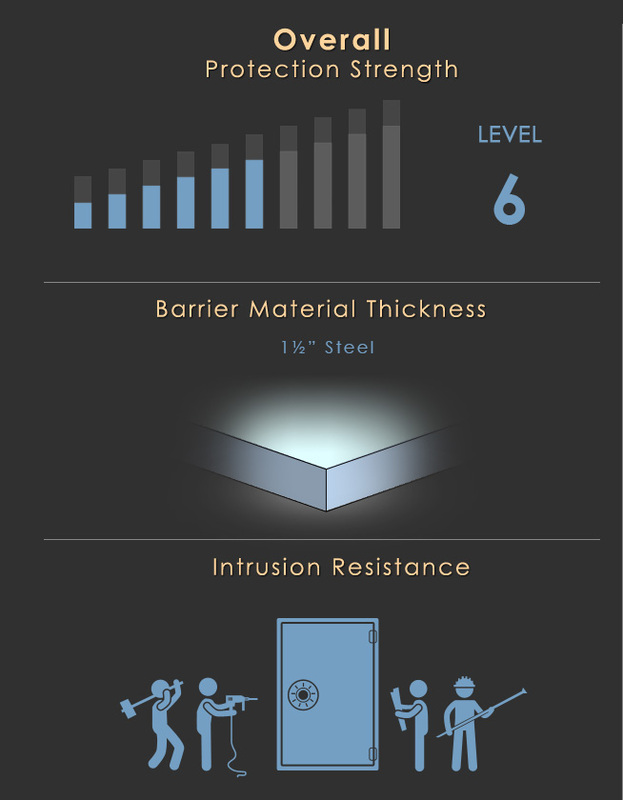 All of our vault doors support wall thicknesses ranging between 6 to 12 inches, accomodating strongrooms to storagerooms and protecting your valuables. We offer vault doors in three stock protection ratings and can custom build a door to any desired size or security specification. The S rating incorporates military-grade ballistic plate armor; the hardest plating we've ever tested. This material exhibits penetration resistance equaling that of carbide tipped drill bits, which have little to no success in piercing its surface. Brown Safe is one of few commercial manufacturers utilizing this nearly impenetrable component to create the strongest consumer vault doors available. Up to 90 minutes of protection of your valuables at 1700° Fahrenheit. *Note: Increases outside dimensions and weight. See 8030 specs page for more information. (Optional) 2½ inch fire resistant concrete amalgamate. Six-sided ballistic armor lock casing. 1 inch diameter case-hardened solid steel locking bolts. Active & passive relocking devices. Exceeds FEMA P-361 and ICC 500 safe room specifications. Clear Door Opening: 78" H. x 30" W.
Rough Opening: 82.5" H. x 38" W.
¼ inch ballistic armor, ¼ inch solid copper, & ½ inch ballistic armor (inside of door). For those looking to use their vault as a panic room this option allows the vault door to be locked from the inside. It provides a mechanical means of locking out the bolt work so even if the correct combination is entered the door cannot be opened from the outside until the inner lock device is disengaged. Additional bolts are added to the top and bottom surfaces of the vault door to further reinforce it against forced entry attempts. 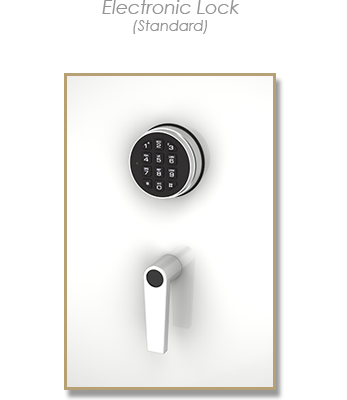 This advanced security upgrade interfaces directly with your home automation or security system to monitor all vault door entries. The alarm or home automation system can then use this information in a variety of ways. For example, the home automation system can notify the owner any time the vault door is accessed, or raise an alert if the vault door is opened while the owner is away from home. In addition, the Bolt Lock Indicator sensor provides verification that the vault door is not only closed, but locked as well, and can send a report via the home automation system when the door has been unlocked for an extended time. silent signal alert feature interface directly with your alarm or home automation system. security authorities, immediately alerting them to the holdup situation. The Multi Sensor Alarm combines both the Silent Signal Alert and Bolt Lock Indicator advanced security upgrades. 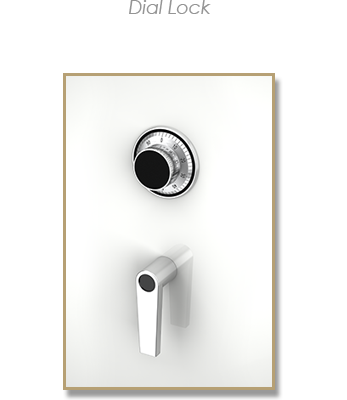 Triggered by either a hidden button or an alternate unlock entry code, vault doors equipped with this feature interface directly with your alarm or home automation system to send a silent alert to security personnel. This sensor provides verification that the vault door is not only closed, but locked as well. It can send a report via the home automation system when the door has been unlocked for an extended time. Beauty and simplicity combine to create an entry method for the traditionalist. 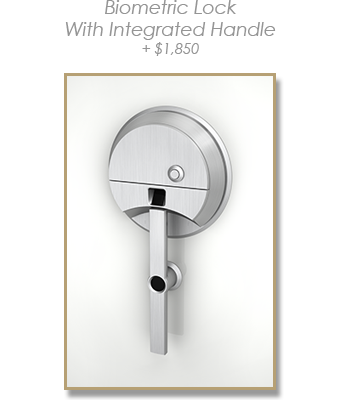 The standard lock which adorns the majority of Estate Vault Doors due to its simplicity and ease of use. 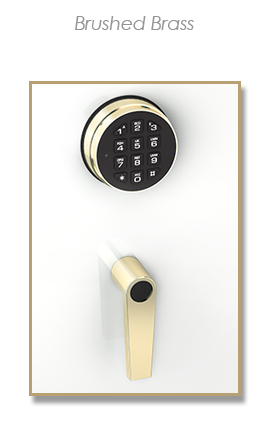 This upgraded high-security lock allows the user to gain access by reading their unique fingerprint. I'm Not Sure Just Yet. With this option a mechanical dial lock is added as a backup entry method to provide the user with the highest degree of reliability. 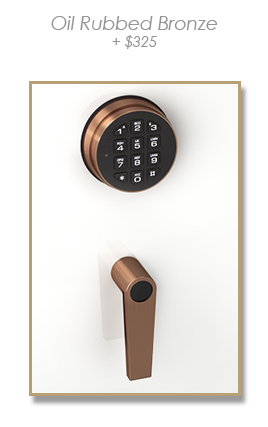 If the electronics of your primary keypad or biometric lock were to fail for any reason then the dial lock can be used to open the vault door. PLEASE NOTE: To open under normal operation simply enter your combination into the electronic keypad or biometric lock then turn the dial lock clockwise until it stops to unlock the door. This exclusive upgrade is pleasing to both arms and eyes. The extra long spoke knobs allow for effortless door operation from any position. Each handle is precisely machined and meticulously assembled by hand to our exacting specifications. To ensure a perfectly consistent finish, the handle and its paired lock undergo the plating and polishing process together. Offered in Stainless, Brass, or Oil-Rubbed Bronze. Estate Vault Doors offer three metal finish choices for your vault door's exterior lock and handle. Choose either a warm brass finish, a cool muted finish of brushed stainless, or a deep lustrous finish of oil-rubbed bronze. All Estate Vault Doors undergo a multi-stage paint process to give the most refined exterior finish available, resulting in a hardened paint finish which is then polished to a high gloss. The above color selections are a sampling of our standard available colors. I Want A Custom Paint Color Instead. Your choice of door swing is available on all Estate Vault Doors. The inswing option allows for the door to be opened even if something falls in front, obstructing an otherwise outer-swinging door. This option should be taken into consideration if the vault door will be used in conjunction with a storm shelter or panic room. This option also works wells for concealing your vault room. Outswing vault doors' locking bolts lock behind a ¾” thick solid steel jamb bar. Inswing vault doors' locking bolts lock into pockets machined in the vault door frame and protected with hardened steel caps in order to insure the door can’t be forced open. When this box is checked, cookies will be used to save your selections in this browser for 7 days. * Please note that the above selections aren't saved if left unchecked.